Wonderful for finishing a dish or when making a dessert. Not after taste like typical sea salt. Try it. A staple in my kitchen. My favourite salt. Love the look, taste and texture. Also very competitive price. Lovely texture. A special treat to serve loved ones and guests. I tried this because I'm a bit of a salt fanatic. Generally prefer salt from France but this in a great addition to my supply. As another reviewer commented it adds a nice crunch. Will definitely buy again from Well.ca as the price is great. Nice, flakes of salt, just need a little, but you could end up with a crunch of salt. Nice to use when cooking. So excited to find this. I've looked high all over. 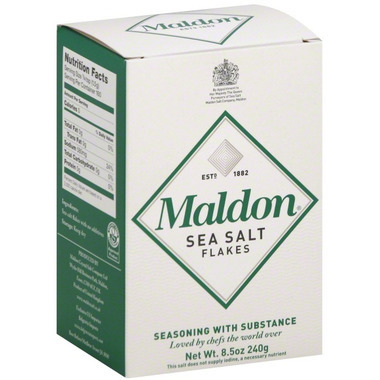 I love this salt because of the texture and it's perfect for sprinkling and finishing dishes. It looks so good prickled on sweet and savoury food! Made famous by chefs for a reason. Love the texture - perfect for sprinkling! As a chef, this is one of my favourite all time salts. Flavour, texture. Well.ca has a great price on this not so easy to find sea salt.